The kids had spring break (week of March 11) off from school. We decided back in December of 2012 to exchange our Perennial Vacation Club week in Lake Tahoe for a week in Bandera during March 9-16, 2013. We reserved a 2 bedroom unit, which has about 1200 Sq. Ft of floor space on two floors. As it turned out, Jeremy had to work during that week, and preferred to make money rather than spend time off vacationing with the family. We left home about 5pm on Saturday, March 9, and headed west on I-10 towards San Antonio. Total drive time to the resort is an easy 4 to 4-1/2 hour drive from Houston. However, we decided to stop in Boerne to gas up the car, and happened to stop at the Wal-Mart to get some grocery items. Although it's usually a good idea to get grocery items at Wal-Mart rather than at local stores in Bandera, we tended to overshop and waste too much time in Boerne. As a result, we found ourselves caught in a miserable rain storm for the remaining 30 miles or so from Boerne to Bandera. When we arrived at the resort, Tom had to run through the rain to get our room keys out of the lockbox by the pool. Then we had to unload the luggage from the car in the rain. Bandera was (and still is) under a severe drought condition. However, we happened to get stuck in the first rain, which that area had experienced in 6 months. Within 30 minutes after we finished unloading luggage, the rain had stopped, and we felt relieved that we could now go to sleep without listening to any more sudden cracks of thunder. 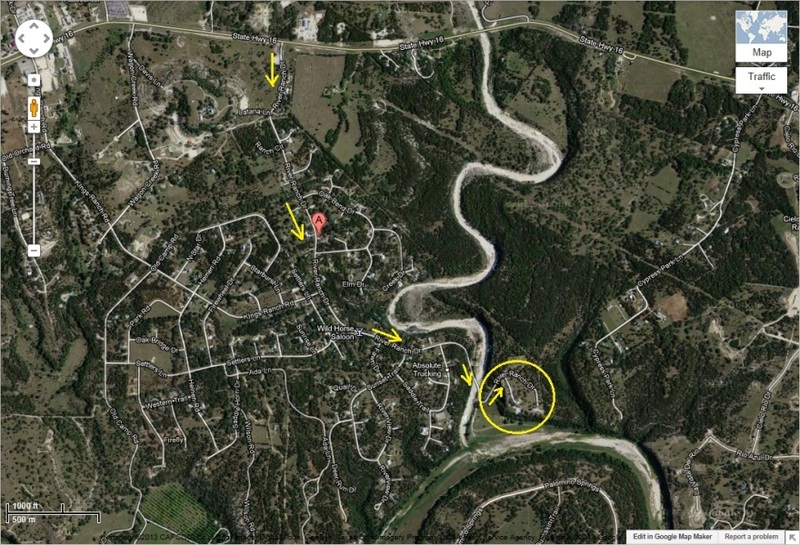 Map to get to Bandera from San Antonio. Aerial photo of route to the Perennial Vacation Club resort from Hwy 16. On Sunday morning, Tom did the formal check-in process, and filled out the paperwork regarding ourselves and our vehicle. Tom also picked up some literature regarding tourism activities in the area. During the week, Tom planned to do as little as possible, since it was vacation. However, the weather, HGTV, reality and procrastination tended to govern what we really did during this week. 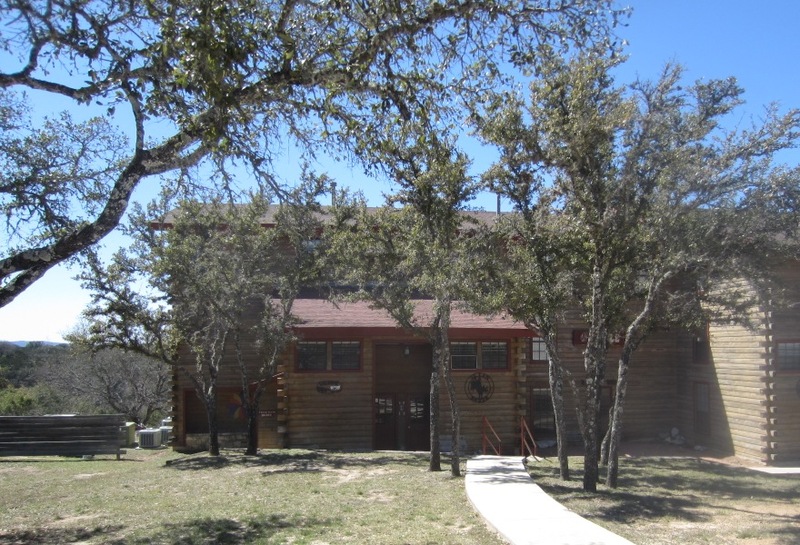 Before the week was over, we found ourselves sight-seeing around Bandera and Pipe Creek, driving over to Fredericksburg, horseback riding at the Lightning Ranch, visiting with dear friends Don and Tricia Carnes, who had retired in Bandera. We also tended to vege out in the jacuzzi hot tub at the resort. Elizabeth was fascinated to see HGTV over the satellite signal coming to the living room TV. Our unit had a second TV in the master bedroom, but it did not have satellite. It only had a cheap HD attenna, which picked up about 10 channels out of San Antonio. Katie slept in the upstairs bedroom, which had no TV at all. She had to resort to watching videos on Tom's notebook computer. The resort allegedly had Wi-Fi available in the lobby. The signal was so slow that we gave up trying to check email on my notebook PC from the lobby. Wi-Fi was nowhere to be found in the units at the resort. Although our cell phones did get a signal for making and receiving calls, the signal strength was weak for timely checking of email via the phone. During the week, we also had our own movie night for several nights in a row, during which we watched a series of contemporary vampire and werewolf movies. Tom brought his tennis gear, in anticipation of playing some tennis. However, that didn't ever happen, because the resort has no courts, Bandera High School has no courts, the local middle school has two tennis courts, but they are not in very good condition, and it was too windy most of the time. There were rumors of tennis courts being available at the Flying-L Ranch, for $5 per person. We did visit Flying-L Ranch to partake of their all-you-can-eat Mexican Food buffet, but did not try out their tennis courts, or golf course, or swimming pool, or other amenties. On Friday of that week, Katie spent the day at Sea World in San Antonio. Elizabeth and Tom drove into SA to pick her up at the end of the day, and we all went out to eat at a wonderful restaurant on Hwy 1604 on the west side of town. We had such a good time during spring break that we didn't want it to end so soon. 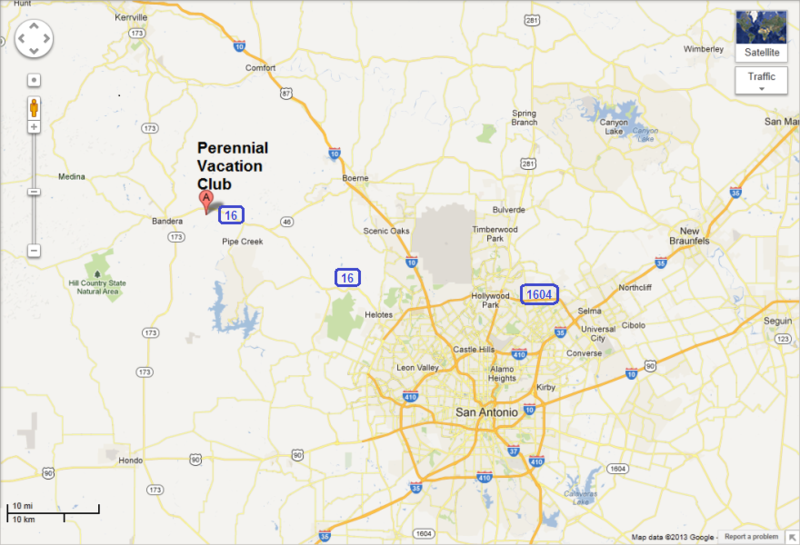 We asked the property manager at Perennial if we could stay an extra night at whatever their going rate was for club members. We were able to stay there another night (Saturday) without even having to relocate to a different unit, and the cost was quite reasonable. We all felt it was well worth the expense. On Sunday afternoon we drove back home, and got stuck in a huge traffic jam on I-10 about 50 miles west of Houston. We had to turn off I-10 and head south on back roads, and eventually found ourselves on Hwy 59 about 30 miles southwest of Houston. Traffic on Hwy 59 was moving slowly, but at least it was moving. We arrived home late Sunday evening, unloaded the luggage, and resumed our normal routine of walking the dogs, going through junk mail, and clearing out email. Front of our unit at the Perennial Vacation Club resort. 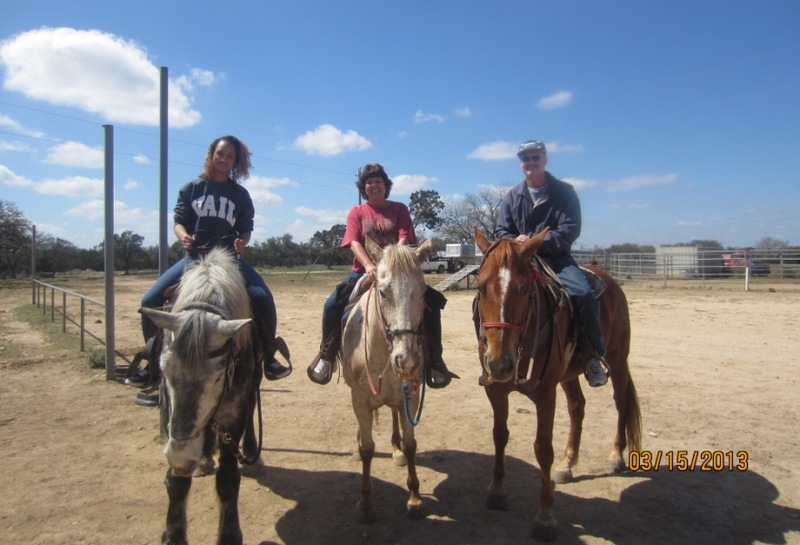 Riding horses at the Lightning Ranch in Pipe Creek. Promotional flyer (front side) for Bandera Businesses. Promotional flyer (back side) for Bandera Businesses. 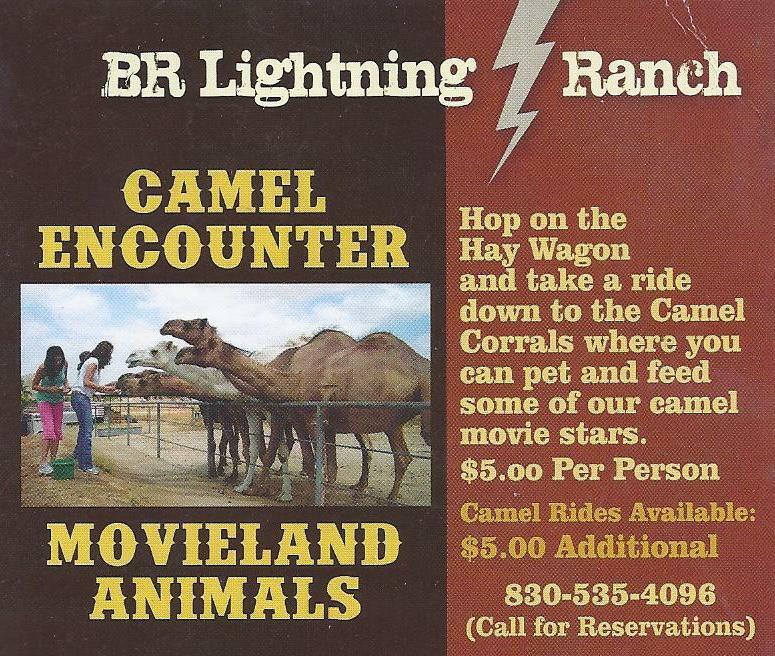 Promotional flyer for the Lightning Ranch . 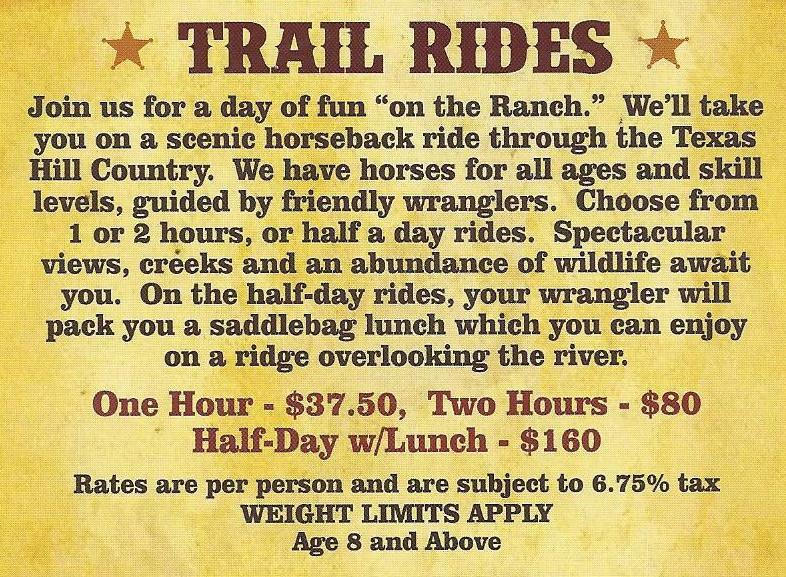 Promotional flyer Trail Rides at the Lightning Ranch. were grouped into four categories, which are linked below. 1. Scenery around Bandera and Pipe Creek. 2. Photos from around the Perennial Vacation Club Resort. 3. Riding horses at the Lightning Ranch in Pipe Creek. 4. Being tourists for a day in Fredericksburg, TX.